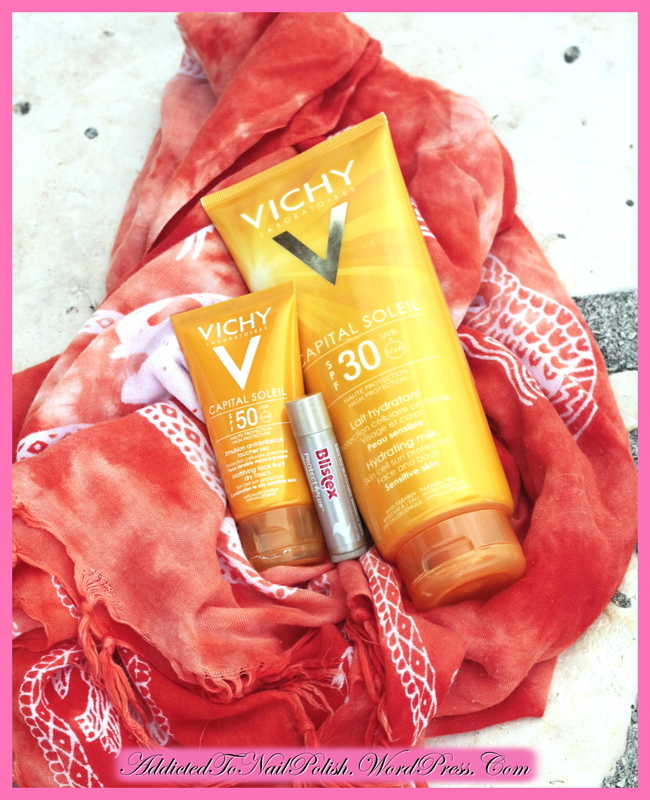 Summerskin: Vichy’s Sunscreens – Mattifying Fluid and Hydrating Milk – review! I was particularly cautious when shopping for my sunscreens this year, the products had to match quite a few criteria of mine. Well, that was the initial idea, but as we know already, there’s no such thing as ideal product. 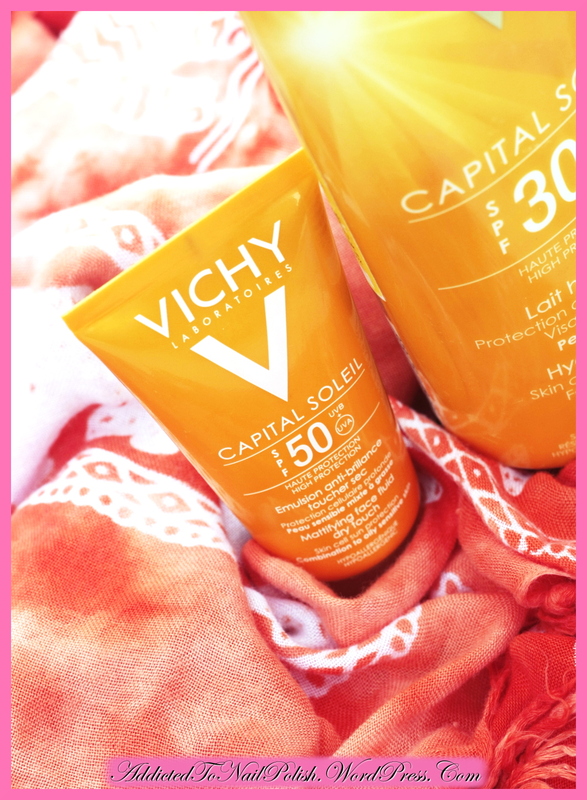 On the end I decided to give a try to Vichy’s products, they seemed the best bargain around my criteria! 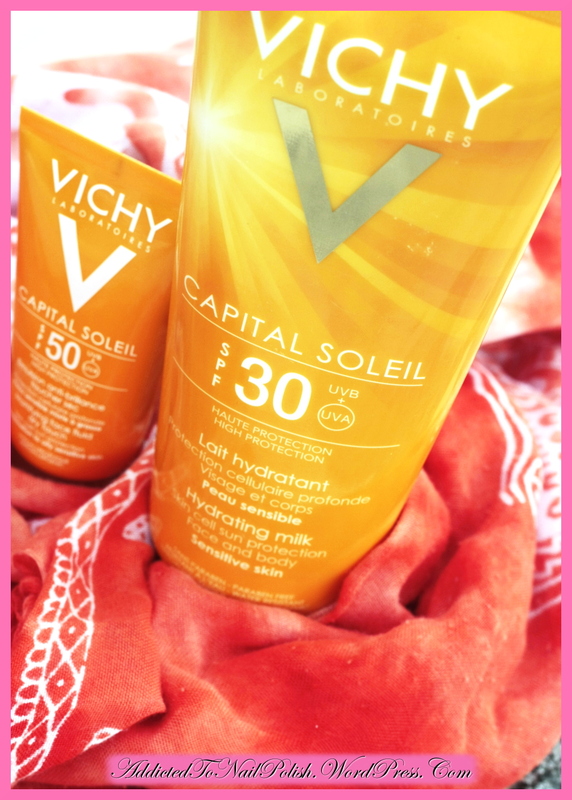 – Vichy Capital soleil Hydrating milk (Sensitive skin) SPF 30 (for the body). I bought the first tube of this cream way back in the spring, this was the second one in line that I brought with me to the seaside. In my haul post I emphasized the importance of using sunscreen, if you don’t want to get all wrinkly in the future; you can took a look at the photos of sun damage on the skin here. I purchased it in a pharmacy for a price around 16€. What do I like about this sunscreen? + it has efficient UVA & UVB filters. I wasn’t sunburnt not even once the whole time wearing this sunscreen! Yaay, thumbs up! + “bad” octocrylene filter is not too high on the ingredients list (it’s on the 11th place). + no weird alcohols on the first places among the ingredients. – the sole presence of a bad “octocrylene” filter in this cream! This is a chemical filter, which is known to act photosensitive on the skin (it absorbs UV rays and irritates the skin this way, also heightens the formation of free radicals). It’s not really an efficient filter, but as I read around, it’s there to make other UVA/UVB filters more stable; I guess we have to make compromise here and allow this octocrylene in the product we use. What’s more, it’s not that high percentage of it in the fluid (given that it’s on the 11th place among the ingredients)! – when combined with Vichy Aqualia Thermal Light Cream underneath, it forms into little rolls whenever you touch your face! – the presence of fragrance in this fluid. It’s found on the 16th place in the ingredients list, and I wonder why. Is it that hard to just pull out all the irritating fragrances that don’t do any good to our skin? This milk is meant for the body and the face, and I was also using it both these ways; for the last week of my holiday my face wasn’t in need of such high sunscreen anymore, so I used this on my face instead. It’s a white milk, acting hydrating on the skin – I loved it! I purchased it in a pharmacy for a price around 20€. It’s a family package, so it contains 300 ml of product. + “bad” octocrylene filter is not too high on the ingredients list (it’s on the 9th place). + no weird alcohols on the first places among the ingredients. We can find Alcohol denat. on the 11th place, but that’s a quite small amount of it. I decided not to complicate about that. + a really minimal – almost non-existing – amount of fragrance in this milk (on the last place on the ingredients list). – the sole presence of a bad “octocrylene” filter in this cream! I already explained why I’m not into this filter; the good news is that it’s not so high on the ingredients list, so it’s not that high percentage of it in the cream. Have to make some compromises! – titanium dioxide and silica in nano particles! 😮 Also explained before (take a look at the face fluid “don’t like’s”! 😉 ). My ladies, this will be it for today. If there’s any question that you have left unanswered from this post, please leave a comment below and I will get back to you as soon as I can. Hvala za obvestilo o tej novi objavi 🙂 Pa super ocena, glede na to da ni nekih sprememb v sestavinah razen TD v nano delcih ga mogoče še kupim, ko spraznim zaloge vseh svojih kremic s spf.